← Day 11: Yay For Zumba! Today was a little crazy. I started out with back-to-back-to-back sewing classes before racing home for a quick run. After my run I had to pack up my books for the first night of my pre-semester intensive class. It was not an ideal day for exercise, and tomorrow will be more of the same. 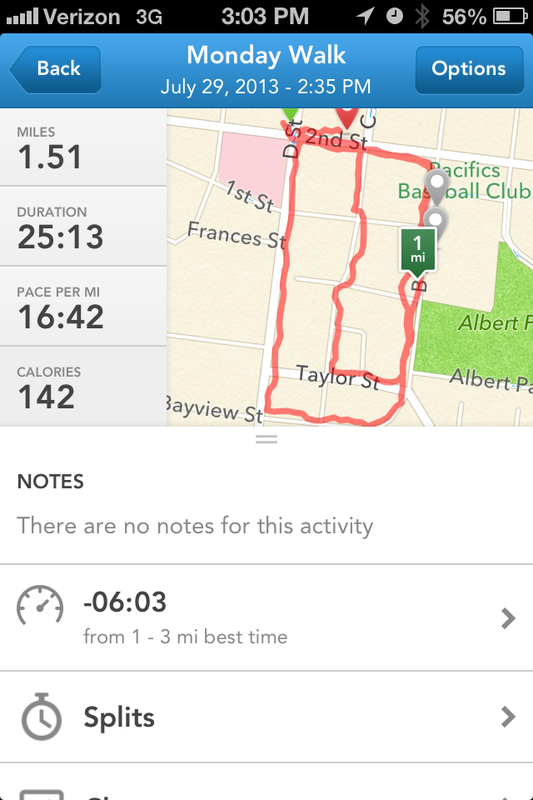 My run was going well, and I had just started my second two minutes of running when the phone rang. Normally I dismiss the call when I am working out, but the call was from a school I had interviewed with the week before. This was a call I needed to take. Luckily it was a good one. My resume is being sent to HR for a reference check, and if all goes well, I will be employed again within the next couple of weeks! The call did disrupt my run, so I cut it short by about 5 minutes. I still had a good pace with a good distance for the time. I was feeling slightly let down that I had to cut my run short, but I did get a second “workout” in class tonight. I’m currently getting my multiple subjects teaching credential, and the department has added a special education class to the requirements. To keep us from having a super high class load, they are offering it as a “pre-semester intensive” and tonight was the first class. For the closing activity, the teacher had us work in pairs with wheelchairs. We each had 15 minutes to be in the chair, and 15 minutes to assist our partner. I was able to keep rolling for the full 15 minutes, and had to assist my partner for 10 minutes. It was a nice lesson in how people in a wheelchair feel, and a great upper body workout! Tomorrow is going to be challenging- work in the morning then straight to class while trying to find sometime to complete my reading assignments in between. My workout will have to happen in the late evening, which is not my first choice.